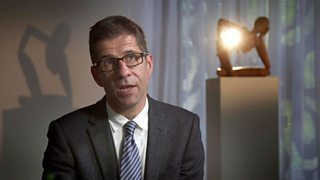 BBC Two - Trust Me, I'm a Doctor, Series 5, Episode 3 - Should I try... mindfulness? Mindfulness meditation has become very popular in recent years. Fans claim it can be used to help stave off mental health problems, such as depression and anxiety, that 1 in 4 people in the UK will experience each year. Mindfulness teaches you to let go of distracting or negative thoughts and focus on the present moment. One idea as to how this might be beneficial is that the practice might help you address unwanted or negative thoughts before they begin to escalate in ways that can affect your mental health. Although the use of mindfulness-based techniques shows potential for treatment, some believe it’s particularly promising as a preventative, resilience-building approach. But can something as simple as mindfulness actually cause measurable changes in brain activity? Dr Peter Malinowski, Reader in Cognitive Neuroscience at Liverpool John Moores University demonstrates with a test on Michael. Michael wore an EEG (electroencephalogram) cap that measured changes in his brain’s electrical activity - picked up by electrodes placed on his scalp. By measuring this electrical activity Peter could measure whether Michael’s brain response to emotional images and distracting sounds went up or down with mindfulness. Michael took part in two different experiments: one designed to look at his response to emotional images and one to test how much attention he paid to distracting sounds. In the ‘emotional images task’, Michael was shown a randomised selection of images known to be emotionally arousing, some negatively and some positively, as well as neutral images (to act as a control). In the ‘distracting sound task’, Michael listened to some standard sounds (80% of the sounds played to him) – which he was asked to pay attention to – punctuated with some less frequent (10%) ‘oddball sounds’ (higher pitched sound) and 10% ‘distractor sounds’ (white noise). He did both these tasks twice – firstly for a baseline, and again after he had practised mindfulness. Michael has practised mindfulness before so it took him about 5 minutes of practice before the start of the experiments to get into a mindful state. Michael’s brain activity while watching the three types of pictures WITHOUT practising mindfulness: neutral, negative (emotionally unpleasant) and positive (emotionally pleasant). Top graph: flow of electrical activity at one electrode (called PZ) centrally on the head; x-axis: time in milliseconds, from -200ms to 1400ms (the picture appears on the screen at 0ms); y-axis: voltage in microvolts. Left image: top view on the scalp surface showing the electrical activity (so-called scalp topography) while viewing the unpleasant pictures; averaged over the time period of interest (approx. 400 – 900ms after stimulus onset – as indicated in light grey in top graph; from -6 to +6 microvolt [dark blue to dark red]). Right image: top view on the surface of the brain (cortex) indicating the neural sources of activity for the same time period, i.e. which brain activity produced the electrical fields measured on the scalp, while viewing the unpleasant pictures. Michael’s brain activity while watching the three types of pictures after practising mindfulness: neutral, negative (emotionally unpleasant) and positive (emotionally pleasant). Comparing Michael’s brain response to emotional images at rest and during the mindful conditions shows that the brain activity when viewing unpleasant and pleasant (blue and green lines) are reduced and now not much higher than for neutral (red line). This is the so-called ‘late positive potential’ (LPP), a brain signal that indicates emotion regulation processes. Usually the LPP is larger when pictures are experienced as very emotional. This we see in the previous slide: the unpleasant and pleasant pictures elicit a larger LPP than the neutral pictures. However, when Michael is in a state of mindfulness during meditation, the difference between pleasant and unpleasant is gone, and also unpleasant/pleasant pictures now elicit LPPs that are only a bit larger than those for neutral pictures. Comparing the scalp topographies (left) and source estimations (right) for negative pictures only, also shows the dramatically reduced brain engagement. Mean amplitudes of the brain responses of interest, contrasting the mental state at rest with a mindful mental state for the images task. Here it is about Michael’s emotional reactivity (indexed by the LPP, late positive potential). In general during rest (in blue) neutral images trigger less activation than pleasant pictures, and these trigger less activation than unpleasant pictures. During mindfulness (orange) there is no change in response to neutral pictures, a slight reduction to pleasant pictures and strong reduction to unpleasant pictures. This shows the potential of mindfulness. Unpleasant experiences are not ignored, but the emotional reactivity is attenuated – importantly: attenuated at will, i.e. if we want to! Obviously, Michael can still respond emotionally, if he chooses to. It’s called emotional flexibility. In summary, mindfulness meditation appears to be allow us to control how much we engage with emotionally pleasant or unpleasant pictures. Top graph: electrical signal (event-related potential; ERP) at a midline electrode at the front (called Fz) for the distracting sound (sound onset at 0 ms) – comparison of activity at baseline (blue) and while Michael was practising mindfulness meditation (red). Note: the P3 brain response is much reduced during meditation, showing that Michael (or his brain) is less distracted by the sound while meditating. The sound is processed to a deeper level at rest than during meditation. The same effect is visible when comparing the two scalp topographies, much lower voltage during meditation (right side) than during rest (left side) and also changes in the brain response. Mean amplitudes of the brain responses (ERPs) of interest, contrasting the mental state at rest with a mindful mental state for the sound task. This graph shows the results from the auditory oddball task – how much Michael’s brain is automatically engaged with deeper processing of the distracter sound (indexed by the P3 ERP component). There was no change for the standard tone. In general the brain responds much more strongly to the distracter sound (that’s normal – and a healthy response), but this response is visibly reduced during a state of mindfulness. Can mindfulness meditation be a useful clinical tool? The evidence is strongest in the area of recurrent depression. At least ten randomised controlled trials suggest that mindfulness based cognitive therapy (MBCT) is an effective treatment to help people with a long history of depression stay well - as effective as other active treatments. In recurrent depression very small shards of experience, thoughts and feelings can quickly spiral downwards into very depressive thinking. What mindfulness enables people to do is to see that happening and step back, and respond in more resilient ways. The evidence for mindfulness-based interventions’ effectiveness for anxiety is more mixed, but there is some good promising evidence for insomnia. There have been a couple of systematic reviews and meta analyses of mindfulness research suggesting that online, web based mindfulness courses are promising ways to reduce stress, lessen depression and lessen anxiety. Mindfulness is associated with mental health and well-being. It is possible that greater mindfulness helps people bring more awareness to their lives and enables them to respond in more skilful ways to stressors. If you practise mindfulness you will most probably benefit from it, but it’s a bit like exercise – many people start enthusiastically, and then give up. You’re only really going to get the benefit if you do it regularly – it’s quite tough to start and the real challenge is to keep going. Some mindfulness-based therapies are available on the NHS, but they may not be suitable for everyone, so take advice from your GP, and while there is some evidence that online tools can be effective, detailed research is still lacking.